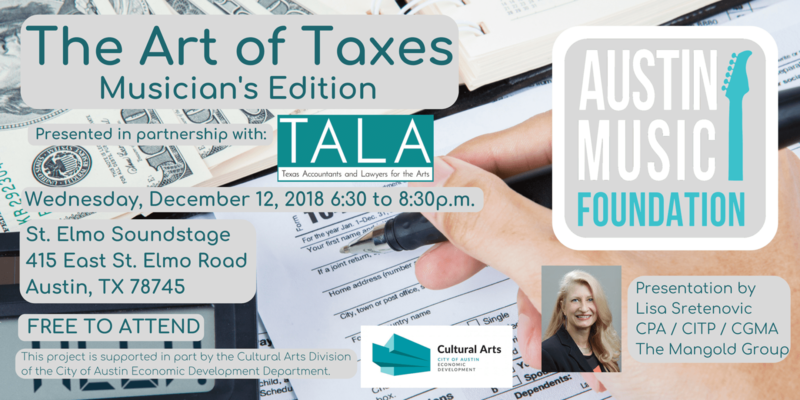 Structured with the unique circumstances of musicians in mind, this seminar is designed to walk you through your tax return, addressing common artist concerns and important IRS regulations pertaining to creative practices. Lisa, a shareholder of The Mangold Group, is an entrepreneurially oriented professional delivering financial and organizational efficiencies to increase the profit in small and large companies. She manages client relationships with customized schedules of services in accounting, tax, strategic planning, budgeting, analysis, process improvement, and training. In addition to 20 plus years of experience, Lisa holds the AICPA Certified Information Technology Professional (CITP), a unique credential designed specifically for the CPAs who have a wide range of documented IT competency. She particularly enjoys the education of financial literacy to non-profits and entrepreneurs. Lisa is a current professional volunteer for artists and arts organizations through TALA and is a past TALA board member.